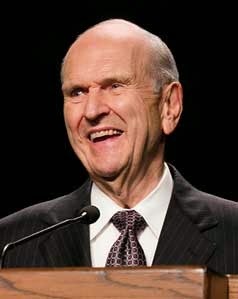 Elder Russell M. Nelson (1924- ) was an internationally-renowned heart surgeon when he was called to serve as a member of the Quorum of Twelve Apostles in 1984. "Happiness comes when scriptures are used in shaping our lives. They speak of the 'brightness of hope' (2 Ne. 31:20) for which we yearn. But if our hopes were narrowly confined only to moments in mortality, we should surely be disappointed. Our ultimate hope must be anchored to the Atonement of the Lord Jesus Christ. He said, 'If you keep my commandments and endure to the end you shall have eternal life, which gift is the greatest of all the gifts of God' (D&C 14:7). "Our hope is in our 'Redeemer, the Holy One of Israel—the God of the whole earth' (3 Ne. 22:5). His hope is in us. We are literally the 'Hope of Israel, Zion's army, Children of the promised day' (Hymns, no. 259). "May the 'God of hope,' in the words of the Apostle Paul, 'fill [us] with all joy and peace in believing, that [we] may abound in hope, through the power of the Holy Ghost' (Rom. 15:13)." And ultimately, in the words of Paul, it is "through the power of the Holy Ghost" that we can be filled "with all joy and peace" as we begin to "abound in hope." What a beautiful and desirable promise! Labels: Atonement, hope, Jesus Christ, Nelson Russell M.